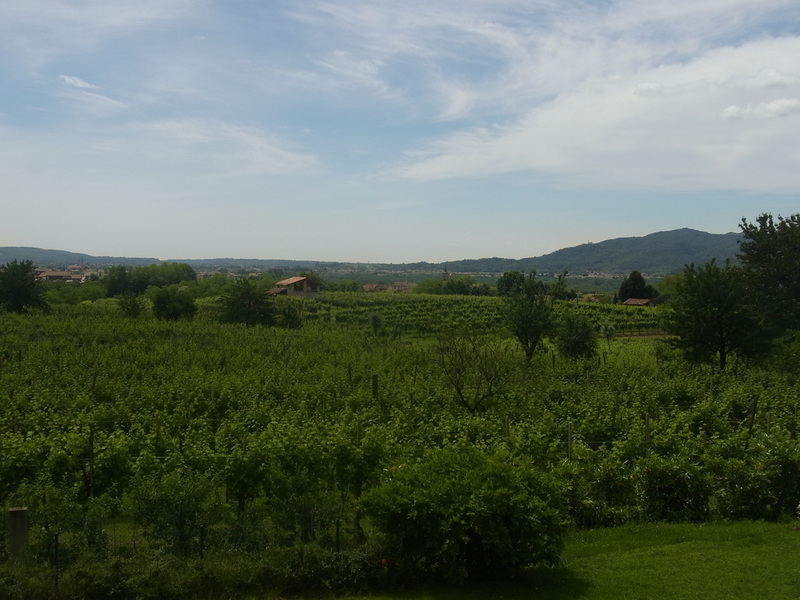 Valdobbiadene is the home of prosecco .. and is a great place to visit! .... three times so far ... and more to come!! Agriturismo Le Mesine offers very comfortable accommodation and great food! ... AND, as they are located within a vineyard, they also produce wonderful prosecco! I first visited in 2014 from Australia, stayed over and had good meals, great prosecco and a comfortable sleep, It was so good that when my wife accompanied me in 2015 I based our trip to Veneto around Le Mesine! We had lunch there twice. We arrived very late on Saturday and Annalisa insisted we sit and she would prepare something for us - a great meal arrived. 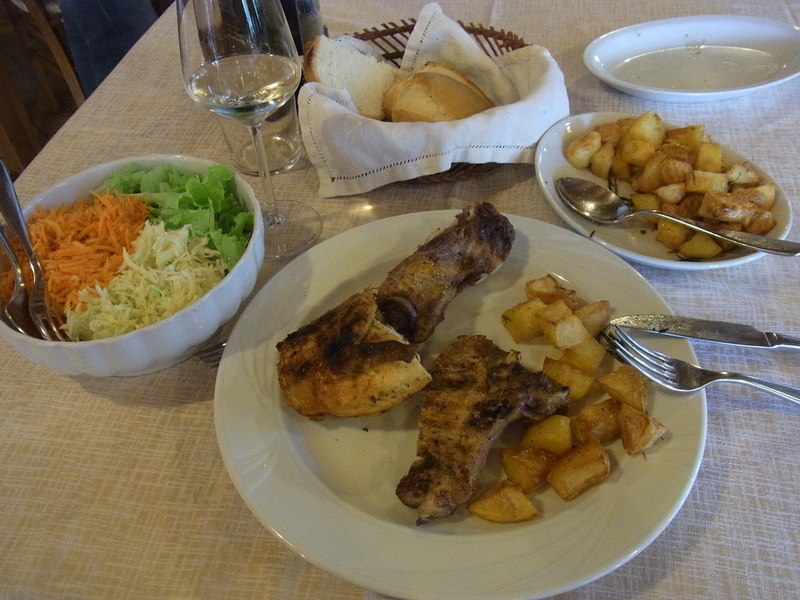 We went back the next day for the rotisseried pork, chicken and rabbit and again had a great meal and a very reasonable cost. We visited again in 2016 and had a wonderful meal. I'm looking forward to 2019! In Valdobbiadene in 2014 I was being very learned, I thought, in ordering my breakfast while staying over at Le Mesine. I asked hostess Annalisa if I could have some hot milk to add to the oats [avena] I always travel with and had brought with me to the table. She responded "Si, s, naturalmentei! ... e il caffè?". "Si, si, but with hot milk", I responded. I THOUGHT she then asked if I wanted them at the same time. "Va bene, insieme [together]", I replied. She delivered a HUGE cereal bowl of coffee [see the picture on above] and I laughed, saying that's not a typically Italian cup of coffee, as they're normally very small. She looked confused for a moment, then said, "No, no, that's for the oats". She thought I wanted to soak my oats in coffee! "Together" obviously does NOT mean "at the same time". It was really funny ... and charming ... and I did get a bonus massive cup / bowl of coffee to start the day! In 2015 we enjoyed the hospitality of the hardworking Massimo and his delightful parents [la famiglia Zanin] at La Rondine ['the swallows']. Everything was really good - an enjoyable time practicing my Italian, great hospitality and good food ... and prosecco, naturally. The views were quite spectacular, very quiet and relaxing. Their recommendation to visit Castelbrando, nearby, was well made. In 2015, after getting a little lost in Valdobbiadene [it's NOT that easy to get lost there] we ended up at this small producer [only 50,000 bottles p.a.] and had a wonderful time talking and sampling prosecco. From the outside it looks like you are entering a a family home ... and it is!! We were hosted by Elisa, one of the five daughters helping run the estate, and also met the proud father. Nothing was too much trouble and we enjoyed hearing the story of the vineyards and of the family and we sampled 'quite a few' of their wonderful products [see photo on the left]. When we departed we were stocked with ample 'supplies for later'. The whole event was one of those 'moments' that happen when you're travelling - we couldn't have planned it better and we had a great time.